A few days ago, my friends and I went to see Jurassic Park in 3D Imax. The theater was mostly empty, so it was just a few families watching the spectacle of a dinosaur theme park, devoid of visitors other than the small test group of archaeologists adorable children, and bloodsucking lawyers. The movie conveniently sends most potential victims off the island in order to hone in on the idea that those velociraptors really have it out for those kids. While we were watching in our slim little crowd, a fight broke out in the hallways of the theater. At first we didn't hear it because of the soundproofed doors. Then, after a moment, someone took refuge in our theater-- she burst into our movie, screaming, and someone full of rage followed her in, also screaming. I was ready to hit the deck. I had one hand out to grab my friend Laura, who was sitting on the aisle, and push us both down between the seats into our popcorn. I was ready to play dead. All of this occurred in my head in about three seconds, because that's how long the fight lasted. They fizzled and left. No one was shot, or hit, or even running around. Just two people screaming at each other with true rage for a second, taking refuge in the dark. When people were killed watching Batman in Aurora, Colorado last year, something changed in me. I was terrified that people would stop going to the movies. When you think about it, the very idea that our favorite American pastime is sitting with a crowd of strangers in a very dark, very loud room-- in seats that are difficult to get out of-- is scary. Horror movies work because the environment is so immersive and claustrophobic. I thought, when that shooting happened, that there might be an instantaneous destruction of the trust we have in crowds. The particular dark of the movies had been violated. I was full of rage that people had been killed in a space so thick with trust. It devastated me, that idea. I love crowds. Living in Connecticut after New York, I miss them-- I miss the rush of people coming off the subway, I miss sold-out shows on Broadway and at the IFC Center. I miss eavesdropping on field trips to the Met. I miss waiting with hundreds of people to buy Harry Potter from a tiny independent bookstore. I used to go do things just to be in huge, gentle mobs of people in New York, who understand that sure, five more people can fit on this subway car. There's always room for more. In Connecticut, where people move to have more space, I've intentionally sought out Bruce Springsteen concerts, UConn games, parades, and opening nights of terrible teen movies, just to be in happy crowds. I also took up running. Running is a strange and vulnerable sport. At first it felt weird to go out with no coat, no phone, and no wallet, and then it felt good. Sometimes I even left my keys at home. I immediately started racing, too, and felt that joy of the crush of people around me. The best part of every race is standing in the crowd of runners. The second-best part of every race is the spectators. Spectators are the heart of the race. They usually come to catch a loved one in a fleeting moment, but for hours before and after that moment, they stay to cheer on everyone else. They watch, they revere the simplicity of individual human struggle and achievement, over and over and over again, and their words give more energy than fifty Dixie cups of Gatorade. Before I watched a race myself, I thought spectating a marathon would be boring. Running is all about personal limits, mentalities, and goals. It is, to me, a totally symbolic act masquerading as a totally physical act. Why would we want to watch thousands of people streaming by, doing something they'll never technically "win"? Because running is not a game, and it's not a test. It's just an action, a peaceful, futile act that some of us do to demonstrate our humanity to ourselves. I am human, this is what my body can do. To watch people by the hundreds and thousands surprise themselves is not just inspiring, it's addicting. Show me a person who's gone to cheer at a race and only cheered for the person they know. Show me a person who's gone away unmoved from the finish line-- it's all beautiful, the superhuman winners, the massive crowds of ordinary folks, and the slow ones-- the gorgeous, the hunched, the overweight; the elderly, the injured, the friends running together; the ones who move to the side as they open the roads back up even though they're not quite done. 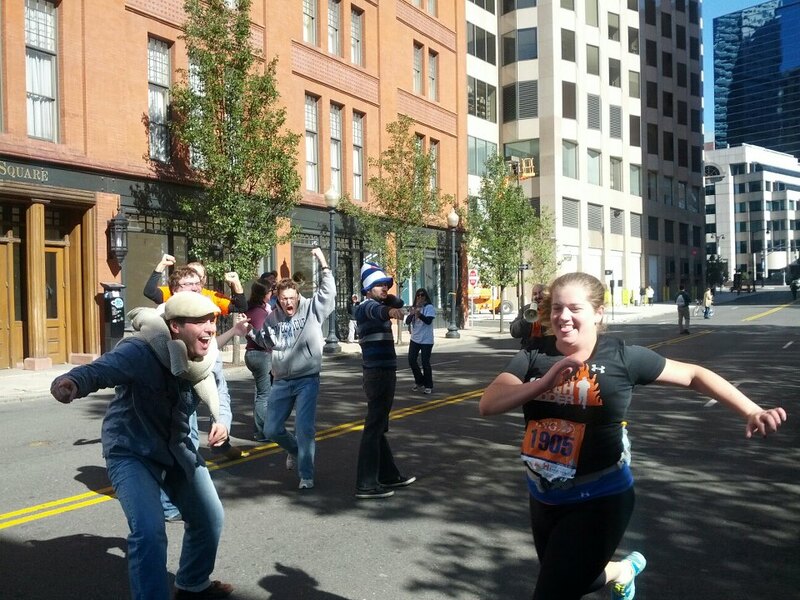 When the bombs went off at the Boston Marathon, everyone thought of the runners first. We tracked the bibs. We thought the people who had lost their legs were the ones who had come to prove what those legs could do: run. But we know, of course, from seeing video, is that the victims were all spectators. They had come not to run but to stand. They were likely all shouting, at that moment, for strangers. Strangers who were either slightly faster or slightly slower than their friends. Strangers who were doing something they'd never done, would never do, or would like to do someday. Strangers who were fueled by the power of someone witnessing their achievements. On that same morning, a New York Times Op-Ed about Guantanamo Bay began to circulate. I read it with horror. Like a lot of people, I suspect, I began to berate myself for not thinking about the world more often and more deeply. I promised myself I'd be a better spectator: that'd I'd keep an eye on what was happening around me, that I'd actively seek to cheer on those that are doing good, and do more good myself. I'd join the crowd again and again, as many times as possible. When the bombs went off in Boston, I thought about how many times that has happened so far away from me, their reverberations barely reaching my ears. This time, it reached my ears. My cousin was there, on the block. The fear reached my ears, then my throat, then my stomach, then my heart. She was fine, thank god, and I cried with the relief and luck that I've never been that afraid before and that it came to nothing for my family. Again I find myself consumed by fear that the crowds will never form again; I'm afraid that we'll all decide to spread out, stay home, stay quiet. I'm afraid that we'll collectively decide that the home theater of the internet will keep us safe while getting to watch. My irrational fear is that we will mistake the meaning of spectating. It is more than just watching your twitter feed reload. There is no theater without an audience to gasp and laugh and listen, and those reactions feed the show and fill the air. I know my fear is somewhat irrational. I know the crowds will never stop forming. After the Hartford Circus Fire, we didn't stop going to the circus; we fixed the fire codes. We still go to the movies, we still work on Wall Street, children still go to school. Crowds make us a target but they also create a thicket of humanity: medical staff, police, strangers, families. All running towards disaster's aftermath, faster than athletes finishing a marathon. We must be there to watch, because when we are called, we must be there to help. We can't always stay home. To protect ourselves and ourselves only, to close the gate, is to leave the rest of the world standing outside, alone. Remember that the T-Rex isn't really coming just for you. Know that, at some moment, you can decide to get out of your car and save someone in another car. Know that at any moment, your amusement park ride could turn you from a spectator to a hero. Don't be afraid. Be ready. Tip from a runner: visualize it, again and again, and when the time comes, you too will run in the right direction. I know without asking that my cousin Jessica helped someone that day; she's helped me up and down mountains and through races before. She has cultivated an automatic generosity and automatic bravery. She has practiced running; she has practiced spectating. I'm glad she was safe, and I'm even gladder she was there to potentially help others. I am a runner now. I am slow and there are many better runners out there. But I will continue to run. And when I can't-- when my legs or my heart have someday given out-- I will take my place and stand and cheer. And if I can't-- if my limbs or my heart have been blown away-- if I am trapped in a dark, loud room-- if monsters tear down the electrified fences we thought would work, to trap us, mere children, in the cars we thought were safe-- if our circus tent goes up in flames-- I will hold out my hand, because I know, I know some stranger will know it's time to turn from shouting and take that hand. In less than one instant. And that's what I promise you, stranger, that I'll do, too.